On the other hand, the trend line in the Monmouth poll was negative for Clinton — she’d led by 4 percentage points in Monmouth’s August poll of Ohio. And it didn’t show her with much of a lead as compared to the strong numbers Monmouth has had for Clinton in other states. In particular, a Monmouth poll earlier this week put Clinton ahead by 10 points in Pennsylvania, making for an 8-point spread between Pennsylvania and Ohio. Quinnipiac showed a similarly wide 9-point spread in its recent polls, with Clinton up by 4 in Pennsylvania but down 5 in Ohio. Is it really plausible that Ohio and Pennsylvania could be so far apart? Our polls-only forecast thinks the gaps states found by Monmouth and Quinnipiac is a little on the high side, and has Clinton up by about 5 points in Pennsylvania and roughly tied with Trump in Ohio,1 making for a 5-point spread. But a gap in the mid-to-high single digits wouldn’t be all that unusual. As Kyle Kondik, the author of a recent book on Ohio’s electoral history, points out, Ohio has been 5 to 6 percentage points redder than Pennsylvania, on average, in elections since 1952. (Before 1952, Pennsylvania was Republican-leaning relative to the rest of the country; it voted for Herbert Hoover rather than Franklin D. Roosevelt in 1932, for example.) And the gap has varied in recent years. In 2000, there was almost an 8-point spread between the states, with Al Gore winning Pennsylvania by 4 points but losing Ohio by 4. Four years later, John Kerry actually did better in Ohio than he did nationwide. The states also aren’t quite as demographically similar as you might think. I’ve often used Ohio and Pennsylvania as canonical examples of states that are correlated with one another, only with Ohio being slightly red-leaning and Pennsylvania being slightly blue-leaning. So I was surprised that our model’s analysis of demographic correlations doesn’t show Ohio and Pennsylvania to be all that much alike — no more so, really, than any two randomly-selected swing states. 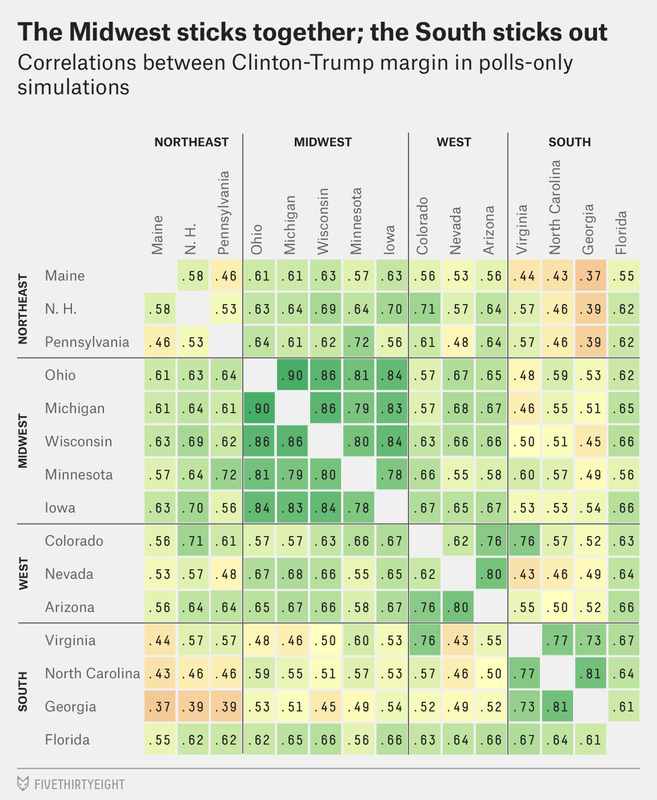 What differences is the model seeing between Ohio and Pennsylvania? It makes these determinations by evaluating five sets of factors: race, religion, education, party identification and geographic region. For a deeper examination of what these factors look like on the ground, I’d recommend reading Kondik on Ohio or Brandon Finnigan on Pennsylvania. But we’ll do a high-level overview here. Race: Pennsylvania and Ohio are highly similar along racial lines. There’s some dispute about exactly how white the American electorate is overall; the figures you see in the table above are principally based on the Cooperative Congressional Election Study, which shows a whiter electorate than other sources, such as exit polls. But by pretty much any measure, the share of white, non-Hispanic voters is higher in Ohio and Pennsylvania than in the country as a whole. And most of the minority voters in these states are black, rather than Hispanic or Asian. Religion: After race, no category is more predictive of American voting behavior than religion. Pennsylvania and Ohio have some meaningful differences on that front, with Pennsylvania having substantially more Catholics but fewer evangelical Christians than Ohio. Party identification: In Pennsylvania, voters specify a party when they register to vote, while in Ohio they do not. The data we use for the model is based on party identification rather than party registration. But this is nevertheless a reminder that Pennsylvania has a stronger tradition of partisanship — and particularly, Democratic partisanship — than Ohio does. Forty-one percent of voters in Pennsylvania identify as Democratic, 34 percent as Republican and just 25 percent as independent, according to our estimates. In Ohio, they’re about evenly divided between the three groups. Education: This is becoming an increasingly important factor, as Trump is performing better than previous Republican candidates among white voters without a college degree but underperforming them among highly educated whites. We estimate that 38 percent of all voters in Pennsylvania have college degrees, which is close to the national average, as compared with 32 percent in Ohio, which puts it in the bottom quartile of states. Geography: Our research has found that dividing the country into four major regions — Northeast, Midwest, South and West — performs surprisingly well as a strategy to understand changes in the vote as compared with more complex methods. But some states straddle the boundary between these regions, and Pennsylvania is one of these. The Census Bureau considers it to be part of the Northeast, and few people would disagree that Philadelphia and the Eastern third of the state belong there. 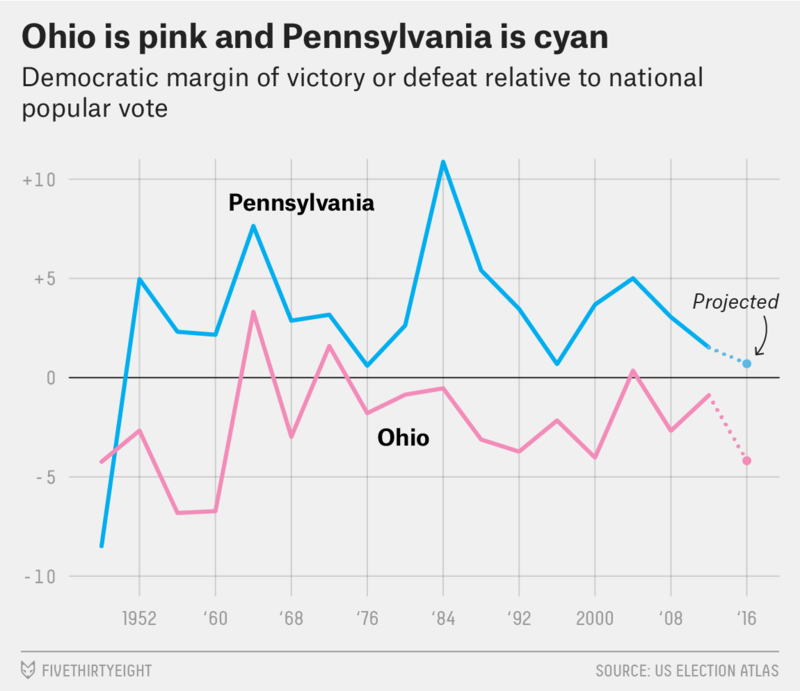 But FiveThirtyEight’s quirky tradition has been to classify Pennsylvania as a Midwestern state politically, grouping it with other Rust Belt states like Ohio. Our model currently splits the difference between these, treating Pennsylvania as half Northeastern and half Midwestern. Ohio is fully Midwestern, by contrast. In Pennsylvania, these changes roughly offset each other. We currently project Clinton to win by 5.2 points there, similar to President Obama’s 5.4-point margin in 2012. But Ohio, like western Pennsylvania, is being pulled to the right with no northeast corridor to offset it. We have Clinton “winning” Ohio by just 0.3 points, less than Obama’s relatively solid, 3-point margin in 2012. Whether we can extrapolate these trends into the future is hard to say. In the short run, they may also be mitigated or exacerbated by the campaigns’ strategies. Kerry’s campaign poured a lot of resources into Ohio, and it almost worked, whereas it’s possible to conceive of Clinton abandoning Ohio for other states like Pennsylvania and North Carolina if the race tightens again. But if Democrats continue to become more of a coastal, urban, cosmopolitan party, while Republicans become more Trumpian, Ohio will become redder and may shed its bellwether status before long. CORRECTION (Oct. 6, 2:15 a.m.): An earlier version of this article incorrectly described the presidential election result in Pennsylvania in 2004. John Kerry carried Pennsylvania by 2.5 percentage points; he did not lose the state to George W. Bush.